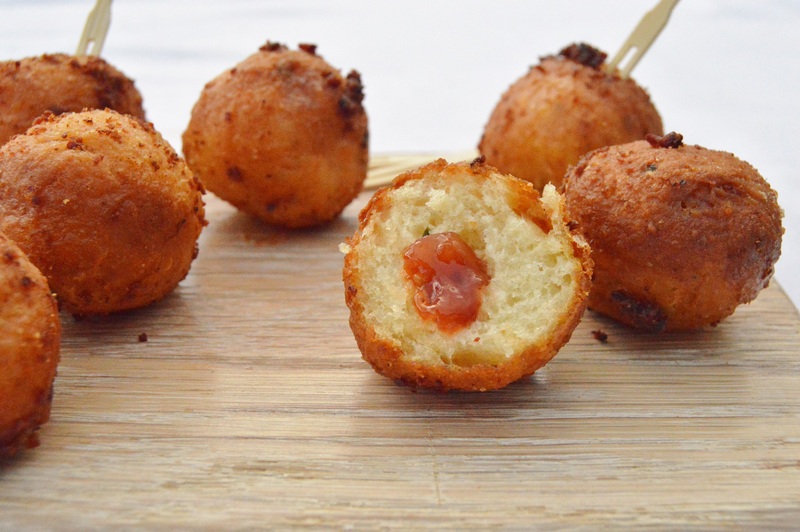 When it comes to sweet doughnuts, my penchant is for those near-spherical doughnuts that are dusted with caster sugar and filled with fresh jam: ideally strawberry jam for me but I would hardly turn down any jam if it is in a doughnut! 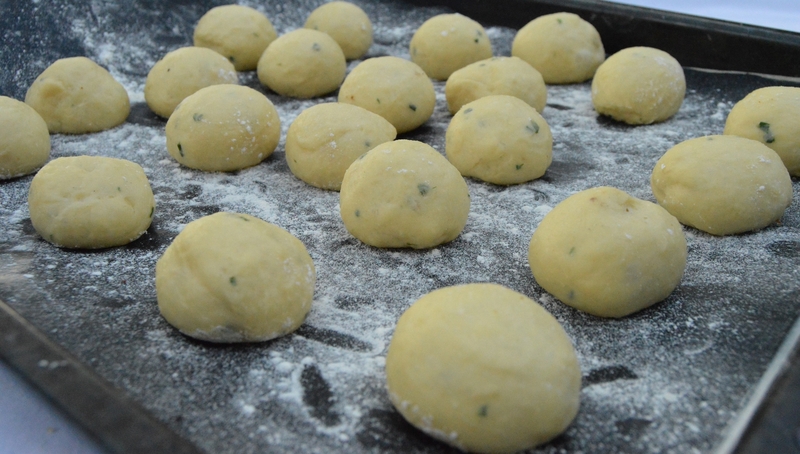 However, a savoury doughnut is a great thing eat; it needs to be small but packed with flavour, and is excellent served either hot (these doughnuts reheat well in the oven) or cold. They are particularly great served as a starter with a good dip. 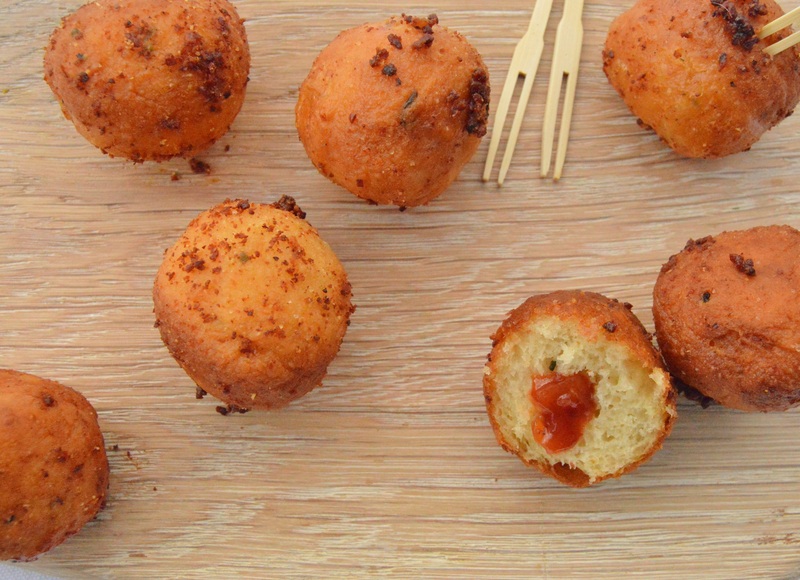 Savoury doughnuts are best made small, making tasty canapés, part of a buffet or a starter. I often like to serve them as one of the savoury components of Afternoon Tea. 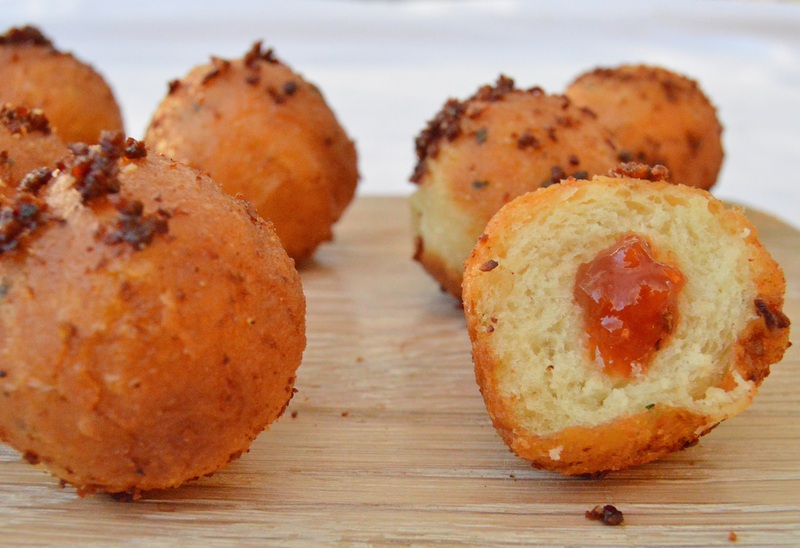 My favourite savoury version uses mustard and Parmesan in the dough itself, with the just-fried doughnuts rolled lightly in a mixture of smoked bacon powder* and smoked garlic powder. Filled with just a little red pepper chutney they are, I think, quite wonderful. They are also excellent with a filling of caramelised onion chutney, chilli jam or tomato chutney. *smoked bacon powder: use rashers of best quality smoked bacon and cook on a baking tray in the oven at 180C(fan) for about 30 minutes, before turning the temperature down to 140C and cooking for a further hour or so until the bacon has dried out, is very crisp but is not burnt. Cool the bacon and blitz in a liquidiser to a fine powder. If you get some lumpier bits that don’t go to a powder, you can sprinkle them over the doughnuts at the end or stick them to the hole where the chutney went in. (1) Mix the flour, sugar, salt, Parmesan and yeast in a bowl. Add the butter, egg, egg yolk, mustard, chives and most of the milk and mix until it comes together. Add more milk, a little at a time, if needed – you don’t want any dry bits, nor do you want the dough to be too wet and unmanageable. 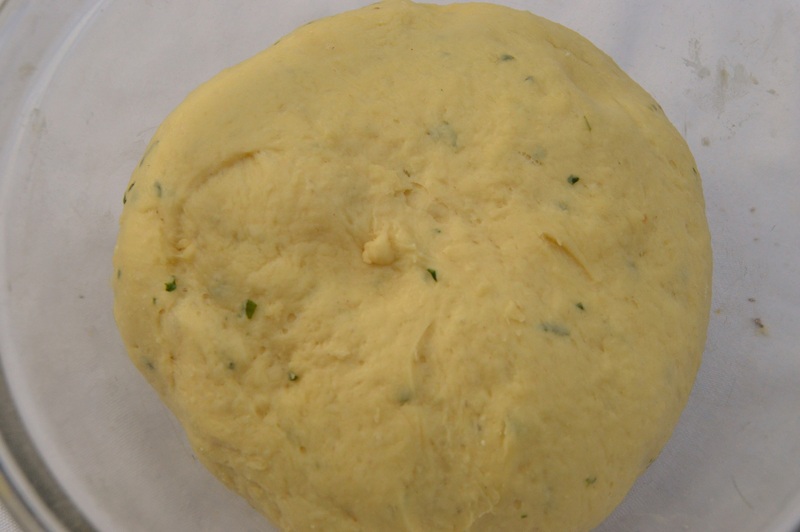 (2) Knead using a mixer with the dough hook attached for about 10-15 minutes on medium speed until the dough becomes elastic and smooth – it should be fairly silky and soft, yet firm enough that it holds it shape without collapsing in a heap in the bowl when you turn off the machine. Resist adding too much additional flour. (3) Turn out onto a very lightly floured work surface and knead lightly to form a ball. Pop this back into the bowl, cover with clingfilm and leave to rise at room temperature until about doubled in size. This could take between an hour or a few hours depending on the temperature: don’t rush it, though: a slower rise is ideal for the flavour you get in the doughnut – an overnight rise in the fridge is even better and does wonders for the flavour. (4) Turn the dough onto a lightly floured surface, knead lightly to knock out the air and cut into 50 small pieces of the same size (about 15g each). Shape each into a smooth ball and then place on a baking sheet dusted very lightly with flour to stop the dough sticking. Cover loosely with clingfilm and leave to rise until about doubled in size. NB: you can freeze the shaped, unrisen doughnuts. (5) Heat oil in a deep-fat fryer or in a saucepan until it reaches 180C. Carefully place the doughnuts into the hot fat, a few at a time. For these small doughnuts cook for about 3-4 minutes, turning them over doughnuts after a minute or so: they should be very puffy and a deep golden brown colour when they are ready. (6) Remove from the oil and place on kitchen paper to drain off excess oil. Roll the doughnuts in the bacon and garlic powder; you don’t want them fully covered, but just a light dusting on the outside. Leave to cool. (7) Make a hole in the side of the doughnuts, going through the centre but not going through the other side. Place the chutney into a piping bag with a fairly small nozzle attached. Pipe a little into the hole until the chutney just starts to ooze out: if the chutney is not smooth enough it might block the nozzle, making this a frustratingly challenging job! Dip this hole end in the bacon powder. Alternatively, slice the doughnuts and place a little chutney inside. thank you Ronit. And also too easy to eat quickly!! Yum, love the sound of these, especially the smoked bacon powder! thanks Jacqui. Yes, the salty-smoky bacon powder adds such a nice kick to them I think. Previous Previous post: chicken, tarragon & roasted onion pithivier: a feast using left-overs!